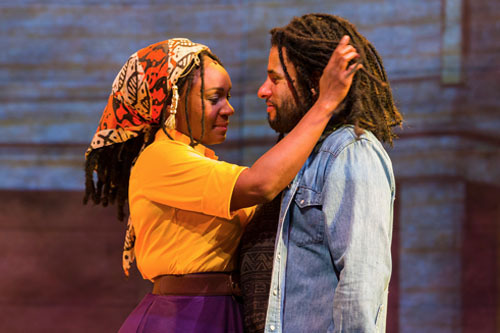 It may seem odd to use the word “enjoyable” when referring to a play that drops the audience smack into the middle of a bloody third world firestorm, but such is the power of the music that punctuates the story in Marley, the current production at Centerstage. Written and directed by Centerstage artistic director Kwame Kwei-Armah, Marley is a brand new biographical musical about a pivotal moment in the life of reggae music superstar, Bob Marley. 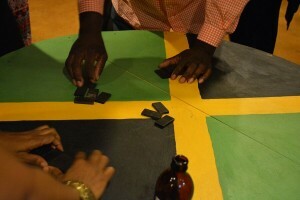 Admittedly, reggae music is not everybody’s bottle of Red Stripe beer. And the idea of spending an evening at the theatre watching rival gangs in Jamaica gunning each other down might hit Baltimoreans as a bizarre choice for what should be escapist fare. 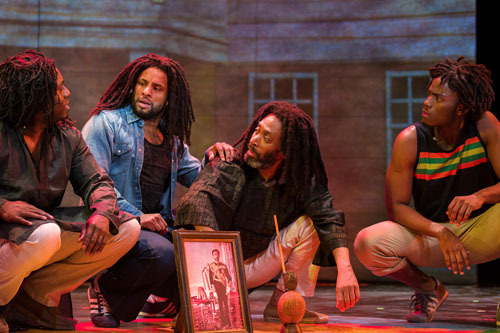 But the music is the thing in Marley, and even this critic – who is not a reggae fan – found himself swaying to the soulful sounds every time the cast broke out in song. The story opens in the midst of the rancorous political upheaval Jamaica experienced in the mid to late 1970’s as a result of a collapsing economy and the coming change in leadership. Bob Marley – a young musician/songwriter who is just beginning to savor his first real taste of international fame – finds himself being dragged into a far different spotlight by the warring factions trying to seize the reigns of political power. Marley chafes at the idea of being cast into the role of the island nation’s social savior, and he only agrees to enter the fray when pressured to headline a unity concert. Unfortunately, despite assurances that the event will be peaceful, violence overtakes the hope-filled occasion, sending the wounded musician on a self-imposed exile to Britain. The question then becomes: Will Bob Marley ever return to his island home, and if he does, what kind of a nation will he find? As previously noted, the music of Marley underscores the entire production. That aspect alone is reason enough to recommended this show. It also must be said that the performances across the board are dynamic. This really is a very good cast. But the play itself feels long, clocking in – with one intermission – at more than two and a half hours. Adding to the viewer’s toil – despite a decent snapshot of the era by dramaturg Gavin Witt – the actual conflict besetting the characters seems elusive throughout the play. Also missing is an honest look at Bob Marley as a man. In selling Bob as a quiet saint, Kwei-Armah glosses over the thorny imperfections, omitting the many infidelities of the captivating crooner. Then there are the Jamaican accents, mahn. This cast – to a man – absolutely nailed the melodious metre of the Jamaican tongue. However, in doing so, a good deal of dialogue was lost on the audience. It’s never good when the post-show reaction of exiting audience members is, “I absolutely loved the show, but I couldn’t understand half of what was being said.” Here both the credit and the blame lie with director Kwei-Armah. Authenticity is commendable – but not at the cost of audible discernment. In the end, if the hearer doesn’t get what is being said, then why bother with the dialog? This is not to say that one cannot follow the story, but a previous knowledge of the life and times of Bob Marley should not be a prerequisite for throughly enjoying this play. Bringing Bob Marley to life is Surinam native Mitchell Brunings. Kwei-Armah set his sights on casting Brunings in the title role after seeing his electrifying renditions of Marley’s music on The Voice of Holland. Brunings’ acting is a bit uneven, though quite forgivable, since this is apparently his first real stage production. But it’s the voice most will want to hear, and musically, Brunings is nearly perfect, leaving this critic with the feeling that he was indeed attending a Bob Marley concert. Owing to the sweep of the story, most of the other cast members must succinctly establish their roles. Don Guillory as Marley’s manager Don Taylor; Howard W. Overshown as Jamaican Prime Minister Michael Manley; Luke Forbes as Tek Life; and Michaela Waters as Bob’s model-girlfriend Cindy Breakspeare; all embrace their parts while setting discernable signposts to guide the audience whenever the story starts to drift off course. Broadway veteran Saycon Sengbloh does a laudable job in the role of Marley’s devoted but ultimately exasperated wife Rita. The pain she feels is palpable – first in her own physical wounding, then in the tangible separation she endures from her absent and straying husband. Also turning in strong performances are Khetanya Henderson (attorney Diane Jobson); Crystal Joy (singer Judy Mowatt): John Patrick Hayden (Island Records founder Chris Blackwell) and Mykal Kilgore, who brings a smile to the opening number (I Shot the Sheriff) in the role of music legend Stevie Wonder. Jamie Lincoln Smith’s portrayal of Marley’s friend and artist Neville Garrick – paired with Michael Luwoye as Wailer’s guitarist Peter Tosh – may be the most gripping dramatic turns of the able cast. On the creative side, Jason Webb directs a small pit ensemble with a rhythmic flair which would surely flatter the late Bob Marley. The guitar and the bass lines are always spot-on; the drums are a bit timid at times. Both the set (Neil Patel) and the lighting (Michelle Habeck) evoke the feeling of a star whose life is in flux. Shane Retting’s sound design hit all the right notes. The choreography (Germaul Barnes) has a lively cadence. The costumes of ESOSA recalled the era with decided flair. A nod to Centerstage for turning the lobby of the theatre into a sandy facsimile of Trenchtown, Jamaica. It should be noted that Marley doesn’t actually end with the curtain call but rather goes on with 8-10 minute “encore” – added to get people up on their feet and dancing. This device was also used quite effectively in the Broadway smash hit Mama Mia. The difference is no one asked those actors to deliver their lines in broken Swedish. Marley is recommended because – even to this Brian Wilson fan – the music is simply that good. But do yourself a favor before going and bone up on the history behind this tale. Filling in the gaps will go a long way to making the production understandable. 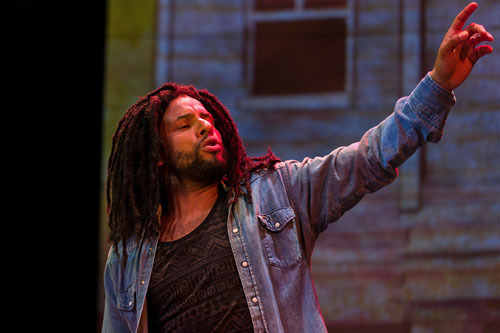 The Centerstage world premiere production of Marley runs now – June 14. Running time (including the ten minute encore) is about two hours and thirty minutes with one ten minute intermission. Centerstage is located at 700 North Calvert Street in Baltimore, Maryland. Tickets and other information may be found online at Centerstage.